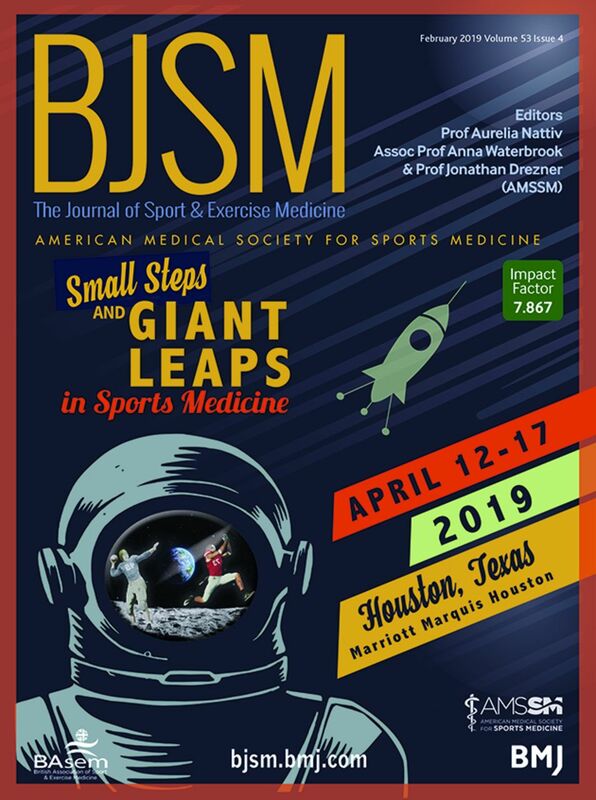 We are excited to present this AMSSM-BJSM issue, emphasising the highest quality clinical research by members of the American Medical Society for Sports Medicine (AMSSM) to help shape ‘best practice’. This call for papers resulted in a record number of high-quality original research submissions, most within AMSSM priority research areas. Each paper submitted received the highest standard of peer review and consideration. Original research papers in this issue include a multicentre randomised intervention trial by Stephanie Kliethermes and colleagues examining the impact of serial sports training risk assessment and counselling to reduce injury risk in young athletes ( see page 243 ); a randomised clinical trial by Kate Ackerman and colleagues on transdermal oestrogen replacement therapy in oligo-amenorrheic athletes to improve bone mineral density ( see page 229 ); and a multicentre study by Emily Kraus and colleagues using a modified female athlete triad cumulative risk assessment to predict bone stress injuries in male distance runners ( see page 237 ). Khodaee Morteza and colleagues also provide an important discussion piece addressing concerns related to portable intravenous fluids in sports ( see page 226 ). The comprehensive AMSSM concussion position statement led by Kimberly Harmon and an esteemed group of colleagues is highlighted in this issue and includes a state-of-the-art review of concussion diagnosis and management, as well as prevention strategies and future directions for sports concussion research ( see page 213 ). Editorials by AMSSM members include Stephanie Kliethermes and Anthony Beutler on clinical research and the AMSSM Collaborative Research Network (CRN) ( see page 204 ); Michael Turner also highlights the AMSSM Concussion Position Statement and provides a contextual appraisal of where we have come in our understanding of concussion diagnosis and management ( see page 203 ). Collaborating together with our colleagues in research endeavours has become a high priority for our society. Development of the AMSSM CRN has helped foster this priority through a multitude of opportunities including grant funding, an upcoming research summit and even a recent trip to the National Institute of Health in Bethesda. AMSSM CRN leaders mingled here with the National Institute of Arthritis and Musculoskeletal and Skin Diseases programme directors and other potential funders to let them know who AMSSM is and what our research priorities are, and to become more knowledgeable about available grant funding for members. This was a huge step forward for AMSSM. Fostering research in our society is essential for the ongoing growth of sports medicine and remains a priority for AMSSM. Evidence-based medicine and following ‘best practice’ guidelines is what we strive for as sports medicine physicians. ‘Best practice’, according to Merrian-Webster, is ‘a procedure that has been shown by research and experience to produce optimal results and that is established or proposed as a standard suitable for widespread adoption’. It is through sound research that we inform best practice guidelines. Neil Armstrong’s quote on taking a ‘small step’ onto the surface of the moon in 1969 changed the world. Similarly, the small steps we take with sharing knowledge, with publishing research and following best practice guidelines will help us take giant steps to help our patients, and on a larger scale, will contribute greatly to our field. With this in mind, please join us for the AMSSM Annual Meeting in Houston, Texas, from 13 April to 17 April 2019 and Research Summit on Youth Early Sport Specialization on 12 April. The annual meeting will highlight youth sport specialisation, mental health, lifestyle medicine, advances in doping and gene manipulation, the state of American football, technological advances in health, economics and management, exercise deficit disorder, the athlete with cancer, and special sessions in sports cardiology, neurology, pulmonology, as well as distinguished guests from the National Aeronautics and Space Administration translating what is learnt in space to clinical practice. Thought leaders will speak on many other topics, and research sessions will be highlighted. The AMSSM Annual Meeting is committed to helping our members learn and apply evidence-based clinical practices, state-of-the-art research and discuss educational initiatives that can positively impact the health and safety of our patients. Contributors AN, ALW and JAD contributed. Reviewed by Babette Pluim to date.